At the NRC, we do our best to be open and keep the public informed about what actions we are taking and why we are taking them. We are also always open to suggestions on how to improve our communications with the public. Reflections on the NRC’s communications since the Fukushima event, including actions the NRC has taken in response. Since Fukushima, are you getting the information you need involving the NRC and the nuclear industry’s progress in implementing lessons learned from the event? Potential actions the NRC might take in the long term to improve stakeholder involvement. In addition to or instead of its current communication mechanisms, how should the NRC communicate about significant regulatory issues? Ways the NRC could partner with other organizations to improve public communication and education on topics associated with radiological safety. Which groups might be open to cooperating with the agency on public communications? Non-traditional places/ways the NRC could communicate its message. Are there unconventional communications channels the NRC is not using that could help get out the agency’s message? Our hope is to get some “out of the box” ideas on ways we can improve howwe communicate with the public. Details about the meeting can be found here. Whether or not you can participate in this meeting, please feel free to provide input on any of the topics listed above by commenting to this blog posting. We will incorporate any comments received here into the meeting summary. I also think that there needs to be a two way public communication. And that you should give a clear, understandable explanation of the situation and problem so that the public who do not have a technical understanding can easily understand what is going on. And that you should also use more communication methods to the public because I believe there are many available technological resources that you can use nowadays. I think you should hire professional lecturers to show how it’s done would be the quickest way to me. That’s all, thank you. From what i can see, the San Onofre restart process has not undergone the traditional peer review process that NRC has used since its inception. This includes peer review by world experts, oversight by the ACRS, and a final process to explain to the affected public that any restart decision was based upon scientific review. The failure of SG tubes at SONGS Unit 2 was not an ordinary occurrence. It is believed to involve such phenomena as fluid elastic instability. If your job, Mr. Rakovan, is public confidence building then a visible, open, and disciplined process is necessary to gain scientific credibility. The comments and effort of respected technical people should not be regarded as coming from anti-nukes. For example, I have worked with one of these technical experts, Dr. Joram Hopenfeld, on a number of technical projects, periodically, over the past 50 years. When Dr. Hopenfeld has concerns, I listen. During the 1980’s I managed the NRC RES program on severe accident source terms and through a process as described above, NRC was able to gain broad public and scientific acceptance of accident source term methodology, including the nuclear industry, as well as those in the public sector concerned about nuclear power safety following the TMI-2 accident. The Special NRC Panel on San Onofre Unit 2 Restart falls far short of satisfying the requirements stated above. The public deserves it. The NRC Commissioners should assure the public receives nothing less. Thank you. Mel Silberberg., USNRC-RES retired . SanO (aka San Onofre) is now a 1.5 Billion Dollar RED FLAG that illustrates how easy NRC regulations can be gamed (without ANY enforcement penalties) which allow Utilities/Operators to make changes that have enormous implications to safety and the Public Health, with little to N☢ actual oversight, until it is to late! (1) TEPCO’s regulator pushed too much paper instead of being “hands on”. (2) TEPCO had total control over what data the public had access to, which prevented any real oversight by the public. The USA cannot afford a Trillion Dollar Eco-Disaster like Fukushima, that is why the NRC needs to “overhaul” how it enforces its current regulations and develop new regulations ASAP to patch all the regulatory holes that now exist! A major first step should be to really open up the entire NRC process to the public, so that true public oversight can take place, instead of the flawed system we now have, as SanO illustrates all too well! As it is now, the public does not have enough access to NRC reports and/or data which prevents all knowledgable people from providing input into the decision making process. I appreciate all of you who participated in the meeting on January 23rd. In my opinion, a number of inventive and innovative ideas were discussed, along with some very valid reminders of underlying communication principles. The MP3 of the meeting will be made publicly available soon, along with a summary of comments heard at the meeting. I agree. Please open the website to input , not just comment. 1. Don’t take advice from the nuclear industry. 🙂 BS isn’t useful out of a govt. agency. 2. Information during a heightened problem needs to be coming out to the public in a timely manner. NOT just during office hours. That may mean having to create a process to release information during off hours when there is a big situation like a hurricane or a large failure at a plant. Problems don’t keep office hours. 3. There needs to be a two layer public communication. Give a clear understandable explanation of the situation and problem so members of the public who do not have a technical understanding can easily understand what is going on. Then include a specific more technical explanation that includes plant systems, what the issue is in standardized terminology and include vital statistics. IE: how many generators are available during an outage situation, how many hours to boil off if cooling was lost, current water levels in a reactor etc etc. so those who DO have the technical understanding can determine what it actually means. This would end lots of the self inflicted problems when there are issues. The public is much smarter and capable of understanding things that some give credit for. 4. There needs to be a system in place where the plant parameter data can be put online publicly in real time if there is an alert or higher situation. Plants already have the ability to send that data to a remote location in real time. Make it public, make a penalty for an operator falsifying that data. That would solve quite a bit of the information vacuum that goes on during these types of incidents. It creates an instant accountability and disclosure to the public. This would also solve quite a bit of needing to relay via NRC staff to the public. 5. Use twitter or other fast communication options for more frequent updates during alerts type situations. Again, solves some of the information vacuum and may create a more streamlined way to get updates out with fewer resources. Faster official bits of information could go a long way towards ending the information vacuum. Information vacuums create rumor, worry and misinformation. 6. Get a handle on the industry interference of the NRC’s public communications. The industry, industry consultants, lobbyists, employees etc. all have their own public communications channels, the NRC isn’t obligated to give them another one. The FDA would never let Pfizer employees disrupt a public meeting or allow them to harass members of the public attempting to hear or communicate with that agency. Why does the NRC let it happen? Having industry wonks constantly interrupting trying to answer FOR the NRC is inappropriate and not constructive. Some of this behavior borders on intimidation of the public by these people. Think of the member of the public who isn’t very assertive but wants to ask a question or hear an answer. Those people should be able to communicate with the NRC without being insulted and verbally bashed over the head by some well known nuclear industry people who do this to squash public conversation and impede communication. 7. Look at newer more efficient communications methods while keeping some low tech ones in place. 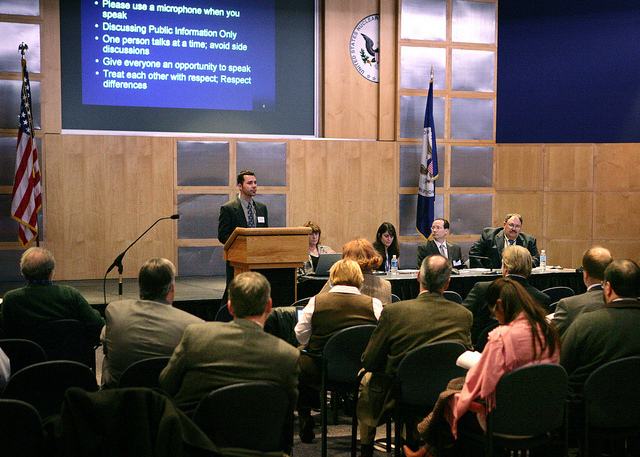 There will always be a need for the ability of the public to submit in writing or use a phone bridge to hear a meeting. But much of the public is more technically advanced. Any issue that allows public input should allow that input to be submitted online either via email or a web form and treat that the same as it would written submissions. Hire professional lecturers to show how it’s done would be the quickest remedy to me. Also, does your training include how to handle media-bait situations such as unreasonable protest demands no business or industry would tolerate and when your findings and conclusions and facts are not what opponents want to hear? Not to sound factious, but if it just boiled down to a pure engineering/management Q&A inquiry session minus passion filler, a meeting wouldn’t last more than twenty minutes. I wish chemical plants and gas and oil facilities which have historic fatal incident track records unlike you all offered themselves to be periodically raked over the coals like you guys! Thank you for attending to the missing post. Deceit and censorship appears to be growing within the NRC. You refused to publish my truthful comment about your security failures, reference “Force-on-Force or Was That a Gunfight at a Nuclear Power Plant” on this blog; then there are the statements from NRC administrators claiming there were no adverse health effects to people as a result of the Fukushima Nuclear Disaster. Apparently the NRC is nothing more than a pawn and propaganda agency for the multinational nuclear industry. Open your paradigm. The restrictions NRC puts on public “input” is like shoving everyone into a lavatory with no windows, no wifi, no cell access. It seems to be under what is interpreted as restrictions on the “process”, but then why in the world not redefine the “process” and whatever the related “restrictions”? Open it up to a bigger public “room” without the defensive measures. The public is remarkably smart and even knows most of the commission jargon and reference codes. The commission defines input so narrowly that it becomes near meaningless. It’s the facile opportunity without the consideration. open the website to input , not just comment. Previous Previous post: Force-on-Force or Was That a Gunfight at a Nuclear Power Plant?